Letter to the Permanent Parliamentary Commission for Economic Affairs in advance of the debate regarding the European proposals. On September 18th the Permanent Parliamentary Commission for Economic Affairs will discuss the proposals regarding European legislation on allowing seeds and other plant reproductive material. In these proposals new impediments are being created for the remaining agrodiversity of crops, while the power of the large producers of industrial seeds is reinforced. Earlier this year, in June, the Parliament voted unanimously in favor of a motion that states the Dutch government will not accept proposals that will threaten agrodiversity. But the degradation of agrodiversity is exactly what the currently proposed legislation will bring about. Since the Netherlands are playing a big role in the seed industry, we ask you to carefully and critically examine the European proposals. The proposal in its current form is not acceptable. Regulation needs to be limited to the trade in plant reproductive material meant for commercial exploitation above a certain level. Exchange of plant reproductive material between farmers and cultivators should remain entirely outside legislation. The selling of diverse old crops also needs to be kept out of the new regulation, which is even more important than tolerating exchange between small-scale cultivators. It needs to remain possible to keep the old varieties out of economic exploitation, including on a small scale. The registration, inspection and regulation of all individuals and organisations that produce or sell special crop varieties is disproportionate and not in the best interest biodiversity. Furthermore, the abuse of intellectual property rights needs to be prevented. As long as there are no property rights weighing on a variety, and no biotechnological cultivation methods have been applied, the registration of all open-pollinated varieties should be possible, but not required. There must be full transparency in the labeling of applied cultivation methods such as hybrid techniques, genetical manipulation and similar methods. The large amount of Delegated Acts in the regulation is unreasonable, and should be limited, in order for democratic monitoring of the implementation of crucial aspects of the new law to be possible. It needs to remain possible for national governments to act sovereignly if the new law increases the monopolizing tendency in the seed industry, which is already being dominated by a very small group of very large scale companies. All quantitative and geographical limitations on traditional and regional seeds needs to be eliminated from the proposed law. The original goals of the law should not be forgotten. The objective was to increase food safety in Europe, the very reason DG SANCO wrote the proposal for the European Commission. Another important mandate of the European Union is to protect biodiversity, also in agriculture. The largest part of the proposed law however is not about this at all. 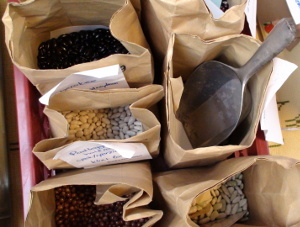 The exchange and use of ‘free’ or ‘special’ seeds is not a threat to food safety, and the regulation is especially harmful for agrodiversity. The proposal seems to be mainly focused on the safety of the largest companies’ interests, at the expense of small-scale farmers. We do not believe the European Union needs to favor such a proposal. The race-lists of agricultural crops are a threat to biodiversity. It is expensive, tricky and sometimes impossible to get and keep varieties on this list. What is not listed is under threat of extinction. Registration and testing procedures should not be disadvantageous for (genetically diverse) varieties. The The DUS-criteria (Distinctiveness, Uniformity, Stability) are applicable to industrial varieties, but not to robust, traditional varieties for which genetical diversity within the populations is a requirement for the adaptability of the crop. Crops that have developed their capacity to withstand unstable and changing climatic conditions have an important function in sustainable agriculture of the future, that will be able to deal with climate change. In their current form the propposed regulations are damanging the sustainable organic farming sector.